My relationship with innovation is ever-evolving. I have always been a traveler who enjoys new experiences. I have travelled far and wide, geographically, and metaphorically, to over 70 countries on every continent. From the UK, now live in Malaysia and my business is based out of Singapore. I am quite adventurous, psychologically curious, and I thrive on change. A thread of strategic innovation has weaved throughout the work I have done over the course of my life: my red thread if you like. From looking at how education was being transformed by technology, to launching new products in start-ups, working in incubators, creating new business models and bridging the gap between organisational culture and innovation, I thrive on uncertainties. These qualities are entwined into the fabric of my DNA. My greatest experience is seeing proven methodologies switch the lights on in people’s minds. I am most satisfied when people are energised to transform themselves and their organisations. What are some of the key challenges you experience in your work with clients? Organisations see the need to make innovation part of their DNA & culture. But, this means they need to develop innovative mindsets and behaviours as part of everyday working life, not just for a select few, or leaving innovation up to chance. The benefits are clear – higher margins, increased customer loyalty, new sources of income and exciting new projects that make a difference in customers’ lives, or more radical impact with business models that open up new markets. But whilst there is a lot of rhetoric and talk about the need to innovate many don’t know how or where to start, or whether they even have the skills and capabilities to generate new ideas and make them work. This leaves them in a dilemma. Innovation requires management, but it is a different form of management to other business processes. You have been developing a tool to address this. Can you tell us a little more about why and how you developed it? Yes, I invented a simple methodology that brings these two worlds together – a clear process that helps to deliver the what of innovation – the output if you like, whether that be new products, services, processes or business models and the how of innovation – the people, the skills, the culture the capabilities. It is called The Six ‘I’s®. It provides a comprehensive, end-to end framework based on a human-centred approach to innovation, blending design thinking with organisational development and a unique proprietary innovation strengths assessment for individuals and teams. We developed it in partnership with work psychologists and industry. The methodology and the assessments have been used in organisations such as the Singapore Government, Cisco Systems, Singapore Airlines and LEO Pharma Asia as well as a range of other organisations. I believe we need to begin from PURPOSE. I call this the starting point that provides an anchor – what are we trying to do and why? We can come back to this place and challenge our assumptions as we navigate the often messy and unpredictable landscape of bringing new ideas to life. 1 Identify: This requires curiosity. Ask questions. Learn and unlearn about things you know nothing about. 2 Ignite: Innovation requires a spark to create something novel. Otherwise, it is business as usual. 3 Investigate: Test, prototype and see if your great idea is going to work. Be critical in your thinking. 4 Invest: Here, we have to make a decision to go ahead with something. And this needs a big dose of courage! Our ability to influence is also critical, and building the right team with necessary skills. 5 Implement: Making it happen is the hard work of innovation! Breathing life into an idea makes something real. Partnerships are key, especially if you don’t have the capability to do it on your own. 6 Improve: This requires a clever mindset, the ability to see where you can leverage and optimise, to make something even better than it is. So what does it do for an individual a team, a company? From a process and output perspective, The Six ‘I’s® provides a common language for organisations – a guide post if you like to help the journey of an idea through to value creation. Within this, we provide a range of tools and approaches to help facilitate each stage of the Model from the IDENTIFICATION of an opportunity through to IMPLEMENT and IMPROVE. The Six ‘I’s® assessment tools, for individuals and teams, offer a strengths approach to understanding what you deem as your core areas of strength across a number of different skills required to innovate. This helps people see where they can contribute to innovation and also where their strengths and challenges will be in working in teams. Where and how can people find out more about the 6 ‘I’s®? We are going to be running a Public Workshop on the Six ‘I’s® in London on 19th January. People can find out more here. 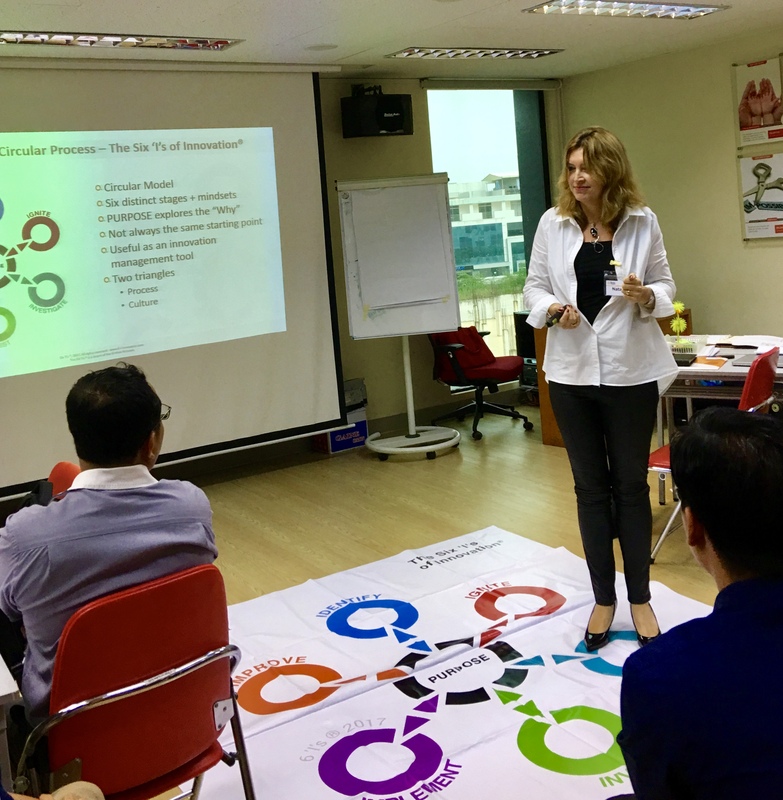 We are also now training people who would like to use the Six ‘I’s® in their organisations to interpret and use the profiling tools as well as facilitate the methodology to help teams create new ideas. Our next programme is also in January. This is suitable for those who work in helping others to innovate, whether it be in-house or as a consultant or facilitator. My book, “Yes, You Can Innovate”, a practical “how to” guide that gives a wealth of tools, tips and approaches, will be published by Pearson in London in March 2018. I cannot resist a final question, how and in which way is working and living in Singapore different from working and living in the UK? I was invited to speak at Singapore Management University on Innovation Leadership in January 2010. Being mid winter in London, and in the middle of a global recession, I was glad to escape the cold weather for a few days and was amazed by the interest and excitement around innovation, the curiosity to learn and the willingness of organisations to invest. Within just a couple of days I had over 22 meetings with people who wanted to know more about what we did. Within ten months, my husband and I moved from the UK and set up a business here. We have been in Asia ever since. It offers a vibrant life and work style, a feeling that anything can happen, an optimism about the world and a willingness to collaborate, network and change. Of course there are many things I miss about the UK, but I travel to London enough to connect back with family and friends and am looking forward to my January visit to stir up some enthusiasm around the Six ‘I’s®.